Owner of Les Promenades King since December 2016, Immex Société Immobilière is proud to announce a major investment to rejuvenate the first shopping center in Sherbrooke. The work will significantly change the appearance of Les Promenades King and will begin in the next few days, lasting several weeks. The project involves repainting facades, changing parts of the exterior siding, modifying lighting adjacent to shops, re-building sidewalks, adding flowers and plantations, installing a new sign on posts, and to improve the visual appearance from King Street West. New benches and flower boxes have already been installed during the summer. Since almost sixty years, this 150,000 square feet commercial center is well established in the life of Sherbrooke residents and its clientele is very faithful to its businesses. Located in the heart of King Street West, it is appreciated for its easy access and its parking of more than five hundred spaces. Nevertheless, merchants were eagerly awaiting the work that will energize its image. “We were very pleased to learn that Immex had bought Les Promenades King last fall. Less than a year later, the work is starting and it is very stimulating for us. 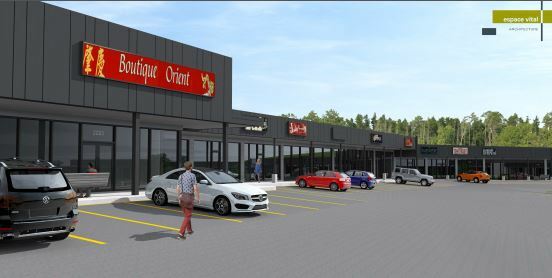 We have always believed in our shopping center and the work’s coming are welcomed very positively by retailers and customers, “says Lynn Germain, owner affiliated with Familiprix. Immex Société Immobilière believes it is important to move quickly. “We offer quality sites to our tenants and we want to bring Les Promenades King to the same level as our other projects. It is important for us to begin work this fall in order to meet the needs of our tenants and their customers, “explains Sébastien Morin, vice-president of Immex Société Immobilière.